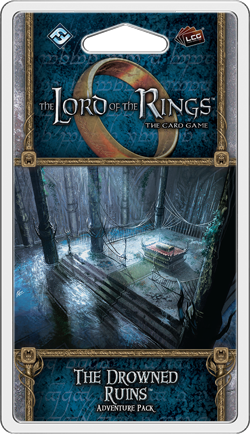 The Drowned Ruins Adventure Pack for The Lord of the Rings: The Card Game is scheduled to arrive at U.S. retailers next Thursday! However, the release of The Drowned Ruins offers you more than the chance to continue your adventures. 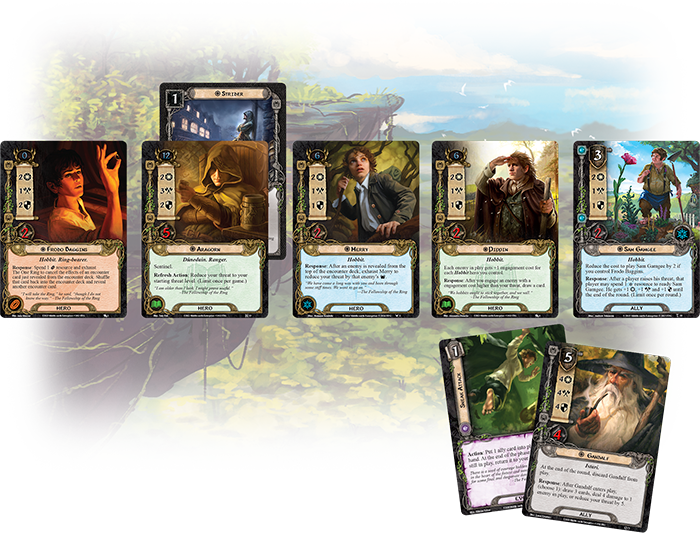 It also introduces a new hero and three copies each of nine different player cards. And that means you'll soon be able to start designing a whole range of exciting new decks, including those that take advantage of the expansion's new, one-cost, neutral attachment, Strider (The Drowned Ruins, 91). 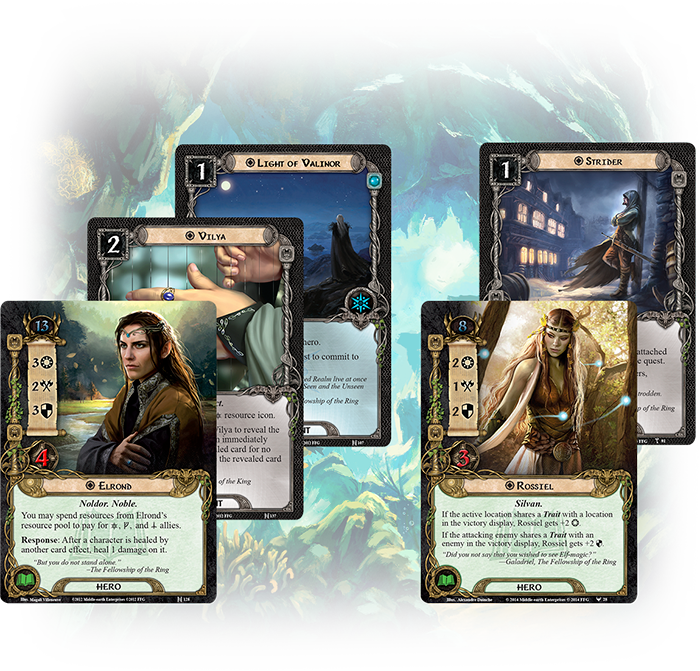 The Lord of the Rings: The Card Game is a customizable Living Card Game®. You have tremendous freedom to build your deck the way you'd like it, and your options are always expanding along with the card pool. It is also a game inspired by one of the best-loved works of fiction the world has ever known, and that means that players coming to the game often bear an interest in recreating some of the themes, scenes, and tensions they remember from the books. These facts aren't in conflict, but it may sometimes feel as though they are. You may wish to develop a small and secretive fellowship—like the one from J.R.R. Tolkien's novels—only to find that it's easier to defeat scenarios with an army of Dwarves or Silvan or allies from the Outlands. 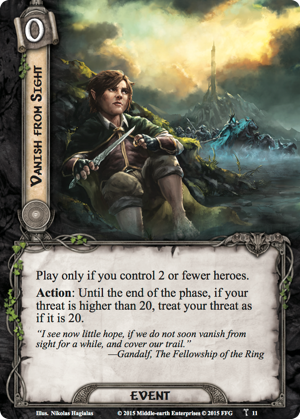 The truth is that, as a game, The Lord of the Rings: The Card Game requires you to find ways to overcome multiple challenges, and it's often easiest to overcome these challenges with a small army of allies at your side. 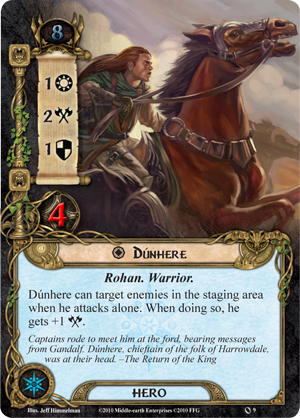 Nonetheless, as fans of The Lord of the Rings themselves, the game's developers have introduced a number of different ways for clever players to help their heroes overcome the obstacles that lie before them—even without a host of allies. 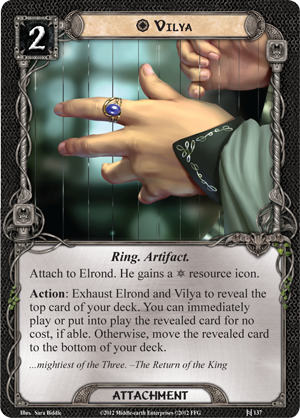 Secrecy, Traps, victory display manipulation, and a range of other mechanics have provided you the means to confront and overcome the Dark Lord's forces without feeling as though you're overpowering them with your army. Strider adds yet another wrinkle to these themed mechanics. 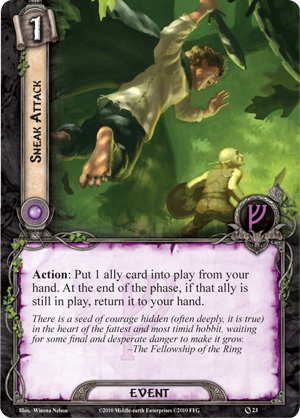 Unlike Secrecy cards, Strider doesn't trigger off your threat, but off the number of characters in your fellowship. Keep your company size capped at five, and the character to whom Strider is attached gains two points of Willpower. Cap your heroes at two, and your Strider can quest without exhausting. 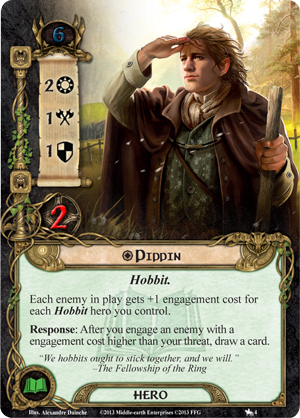 The natural target for Strider would be one of the different versions of Aragorn, and it would be easy enough to imagine playing him through the scenarios of The Black Riders Saga Expansion alongside Merry (The Wastes of Eriador, 1) and Pippin (The Black Riders, 4), plus the expansion's unique Fellowship-sphere version of Frodo Baggins (The Black Riders, 1) and the new ally version of Sam Gamgee (The Thing in the Depths, 35). 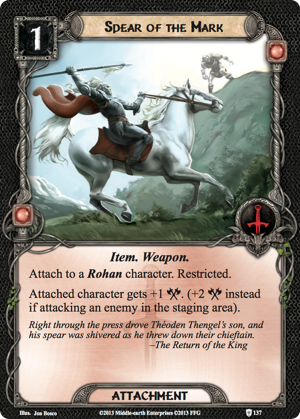 You could even bounce Gandalf (Core Set, 73) in and out of play with Sneak Attack (Core Set, 23), and depending on how you time his arrivals and departures, they wouldn't take anything away from Aragorn's role as Strider. 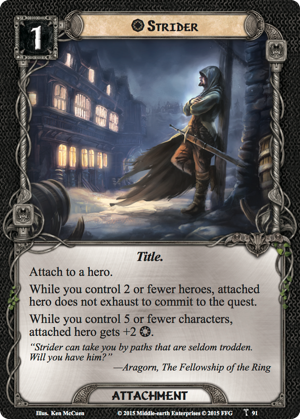 In this fellowship or a similar one, Strider becomes a cost-efficient boost to your Willpower—one that might even allow you approach your adventures differently, relying upon fewer characters, and asking each of them to do just a bit more. 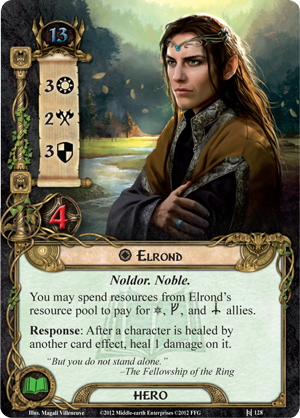 Of course, although Aragorn may be the most obvious Strider, the Strider Title can actually play on any hero, meaning it can lead to all manner of interesting new combinations, especially for players looking to play with two or fewer heroes. 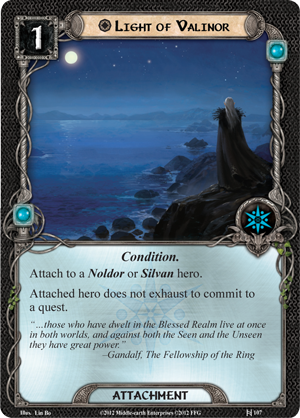 For example, you could run a deck with two Noldor or Silvan heroes and play Strider on one of them and Light of Valinor (Foundations of Stone, 107) on the other, and neither would have to exhaust to commit to the quest. 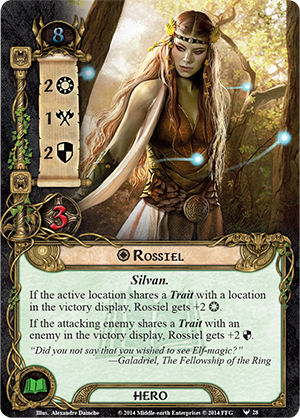 This might mean that Elrond (Shadow and Flame, 128) would be able to quest, then still use Vilya (Shadow and Flame, 137) for its effect, while Rossiel (Escape from Mount Gram, 28) could quest and then exhaust to defend with a Defense Strength of four, provided she faces an enemy that shares a Trait with one in your victory display. 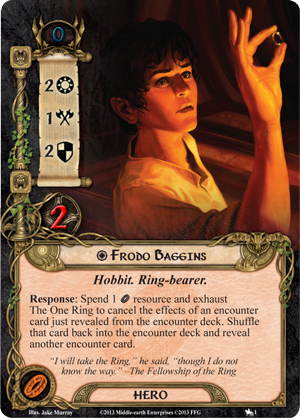 And what if Strider hadn't been asked by Gandalf to help Frodo along his journey? 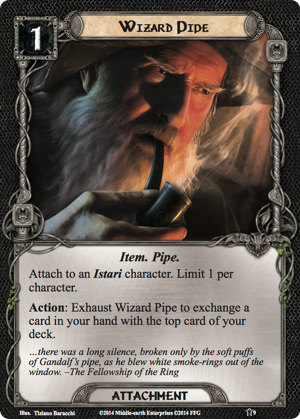 What if Gandalf had returned, using the guise of "Strider" to throw his many enemies off his trail? 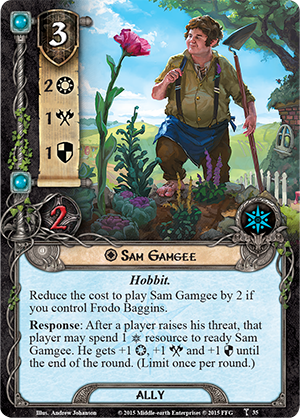 The Gandalf hero from The Road Darkens (The Road Darkens, 2) is another excellent target for the Title, especially as the Grey Wizard is one of the few characters in Middle-earth to have wandered as far and wide as the heir to Gondor. 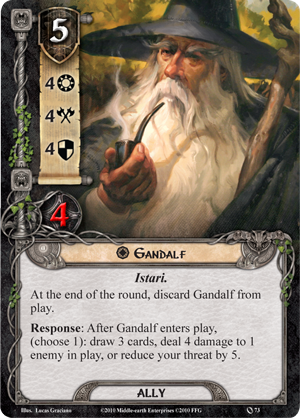 Gandalf's ability to play cards from any sphere from the top of your deck—once per phase—makes him a uniquely versatile character to run in a deck with just one or two heroes, especially if you can use a Wizard Pipe (The Road Darkens, 9) to ensure you can stack the top of your deck. In fact, by eliminating your hero's need to exhaust to commit to the quest, Strider opens the door to a wide variety of two-hero strategies. 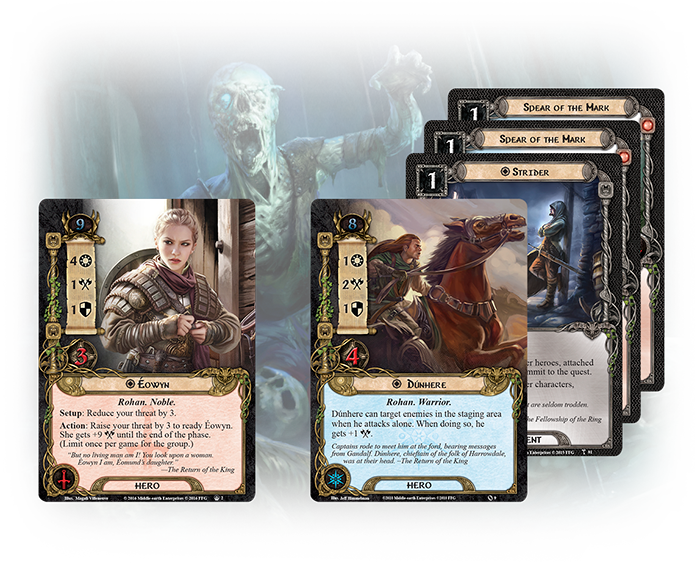 There are three basic tasks in The Lord of the Rings: The Card Game that demand your attention: questing, defending against enemy attacks, and attacking your enemies. Typically, this demands the divided attentions of your three heroes and makes it hard to play with fewer. However, if one of your two heroes no longer needs to exhaust to quest, that hero remains available to defend or attack, and you still have two heroes remaining for those tasks. 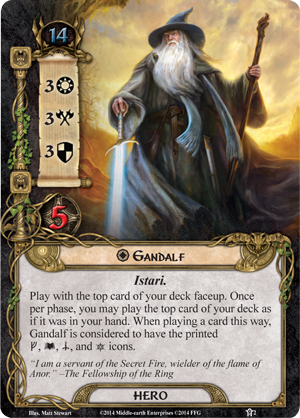 With Strider, you can get more use out of heroes like Gandalf who combine high Willpower values with high Attack or Defense Strength values. 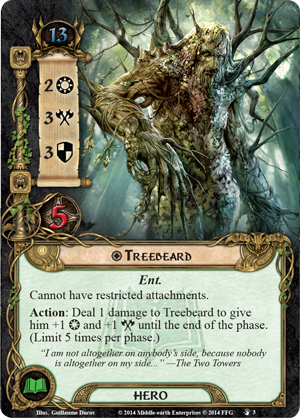 Other examples include Thorin Oakenshield (The Hobbit: Over Hill and Under HIll, 2) and Treebeard (The Treason of Saruman, 3). 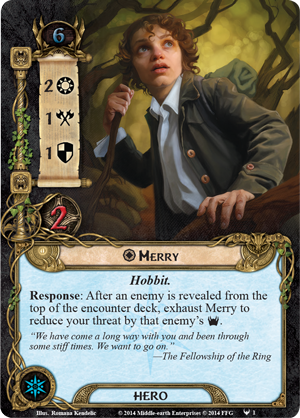 And who wouldn't be amused by the thought of basing a fellowship around the inclusion of an Ent who has traveled tirelessly back and forth across the face of Middle-earth? Of course, there are other benefits to running fellowships with just two heroes. One of them is the fact that it's easier to keep your starting threat low. Then later in the game, when time and the encounter deck have raised your threat, playing with just two heroes may allow you to Vanish from Sight (Flight of the Stormcaller, 11) in a critical Engagement phase or when you need to play a card with the Secrecy keyword. Even if you don't run Secrecy cards in your deck, you might benefit from the ability to keep your enemies in the staging area. 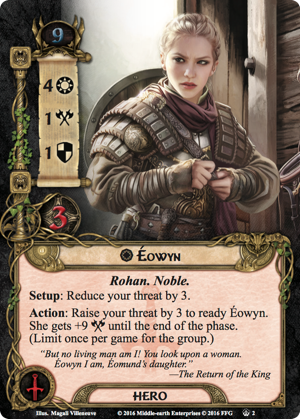 For example, Strider makes it feasible to run a fellowship of Éowyn (The Flame of the West, 2) and Dúnhere (Core Set, 9). Right out of the gate, playing Strider on Dúnhere allows you to quest for seven Willpower, and then he can still attack an enemy in the staging area in the Combat phase. 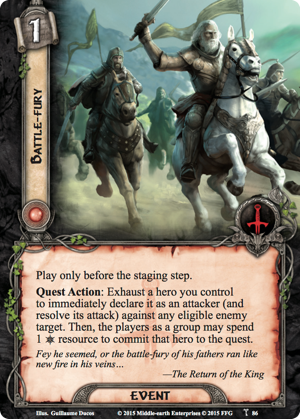 Or with the new event, Battle-fury (The Drowned Ruins, 86), Dúnhere can even attack an enemy in the staging area during the Quest phase. 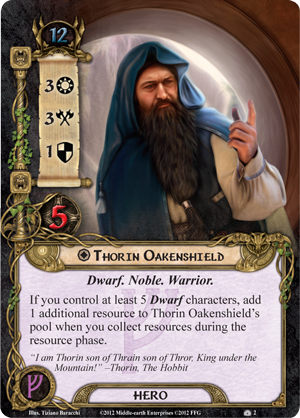 Give him a Spear of the Mark (The Morgul Vale, 137) or two, and he can attack for as much as seven Attack Strength before the enemy ever has a chance to engage you. Strider, Battle-fury, a new Silvan hero, and a host of other new Silvan cards from The Drowned Ruins look to open a wide range of new deck-building options and player strategies. The Adventure Pack is due to arrive to retailers next Thursday, and you can bet that Strider will be willing to strike off into the wilds immediately. Will you have him? Make your plans to pick up The Drowned Ruins next Thursday. Until then, you can head to our community forums to voice your thoughts about Strider, Battle-fury, and the pack's other player cards!